U.S. Immigration and Customs Enforcement (ICE) announced that they intend to propose a rule to limit the amount of time international students can stay in the country by eliminating the "duration of status" or "D/S" policy. Urge your members of Congress to speak out and publicly defend international students. Speak out for students, scholars, and policies that matter to you! Educate Congress on how international education impacts your state and district and why we need a more globally engaged and welcoming United States. 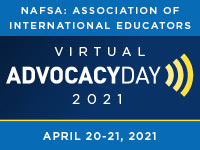 Registration for NAFSA's 2019 Advocacy Day is now open. Email and tweet at your Senators and Representative about the dollars, jobs, academic and cultural benefits international students bring to your state. Share your stories about the positive impact international students have on our communities. Use our advocacy toolkit to request your member of Congress make a public floor statement in support of international students. 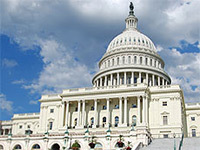 Urge your Senators and Representative to cosponsor the bipartisan Dream Act (S. 1615; H.R. 3440). This bill would protect young people brought to the United States as children without documentation. These young people are American in every way other than on paper. The United States is the only home they have ever known. We need an immigration system that allows these young people to continue their studies, enter the workforce, and continue to give back to our communities. Urge your Senators and Representative to cosponsor the bipartisan Senator Paul Simon Study Abroad Program Act or thank those that have already cosponsored. Take a minute to personalize the letter provided and explain why you support this bill, allowing more American students to get the global skills they need to succeed. Urge your Senators and Representative to cosponsor the bipartisan Freedom to Travel to Cuba Act (S. 1287; H.R. 351). Take a minute to personalize the draft letters provided and explain why you support this bill, making it possible for Americans to travel freely to Cuba, as they can to any other country. 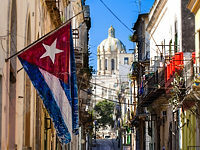 NAFSA Educators for Cuba, a project of the NAFSA Cuba Engagement Initiative, provides policy leadership and targeted advocacy campaigns to end the U.S. trade embargo and travel ban on Cuba. Nora Cavazos was presented with the 2019 Advocate of the Year Award by NAFSA President and Chair of the Board Ravi Shankar on March 19, 2019 in Washington, D.C. as part of NAFSA's 2019 Advocacy Day. NAFSA is proud to continue our partnership with Welcoming America’s Welcoming Week (September 14-23). Welcoming America is a network of U.S. cities, counties, states, and non-profit organizations who bring together host communities and immigrant and nonimmigrant newcomers. Throughout the spring, NAFSA will provide additional information on ways that your campus or institution can participate in Welcoming Week, a nationwide effort to highlight how our communities and campuses make immigrants, students, scholars and visitors feel welcome. What is your vision for our world, our country, and our leaders? Watch the video and join the #IAdvocateFor campaign on Twitter. NAFSA's Global Leader Awards recognize members of Congress that are champions for international education and advance policies that create a more welcoming and globally engaged United States. Take action for international education and global engagement. Contact your elected officials. Share your story. Join today!